It is getting a little tired and needs a refurb but it was close to the Motorway. In a commercial area of the town surrounded by warehousing and retail units. Main road location means convenient for a stopover but not a long stay hotel. Evening meal good but breakfast limited but adequate. 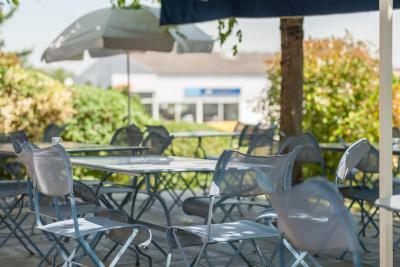 Great location, while its on a busy strees once you are behind the hedge everything is more relaxed. Room was clean and cosy. Staff speak French and I do not, but we understood one another. 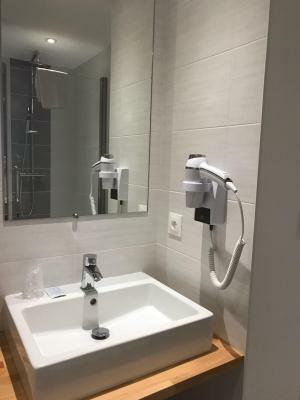 La salle de bain est complètement neufe et propre. De locatie was aanleiding voor de reservering, en die was oke. Net als het ontbijt, kleine croissantjes, pain au chocolat, stokbrood, yoghurt, kaas, uitgedroogde en verkleurde ham, jam etc. Oke...maar dan ook niet meer. 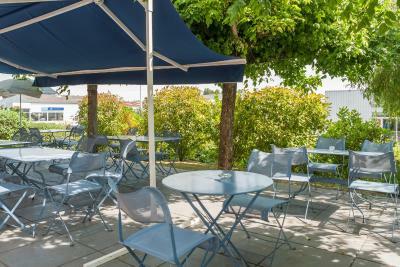 Newport Hotel Restaurant is 1.9 mi from Villefranche Train Station, just next to the Saône River and the A6. It offers rooms with an LCD TV and free Wi-Fi access. When would you like to stay at Newport Hotel Restaurant? This room features a flat-screen TV, free Wi-Fi access and a private bathroom. House Rules Newport Hotel Restaurant takes special requests – add in the next step! Newport Hotel Restaurant accepts these cards and reserves the right to temporarily hold an amount prior to arrival. Please note that the restaurant is closed on Saturdays, Sundays, public holidays and during Christmas season. The self-serve breakfast buffet is open from 07:00 to 10:00 on Saturdays and Sundays and is at a EUR 9 fee per person and per day. The front desk is open from 17:00 to 22:00 on Sundays, check-in is available only between these hours. On Sundays and public holidays, the hotel and reception close at 11:00 and opens at 17:00. Restaurant closed (a;ways been open before) Some features a bit dilapidated, even for a two star. Large bedroom. Family staff friendly. Free parking, good WiFi, clean, affordable. The breakfast was a massive disappointment. For EIGHT euros I was expecting something more than a four inch piece of hard baguette, small slices of cheese and sliced ham with a few other minor nibbles not worth trying. Save the money and buy something from the supermarket. Bitten all over by bedbugs/fleas I'm afraid. Still itching. Cheap and nasty. There are better places.